A mangonel was a type of catapult or siege engine used in the medieval period to throw projectiles at a castle's walls. A mangonel had poorer accuracy than a trebuchet (which was introduced later, shortly before the discovery and widespread usage of gunpowder). 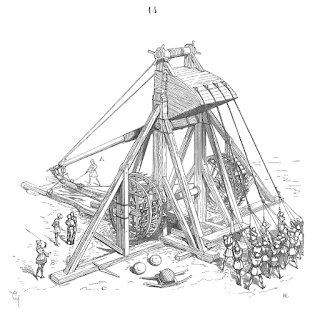 The mangonel threw projectiles on a lower trajectory and at a higher velocity than the trebuchet, with the intention of destroying walls, rather than hurling projectiles over them. It was more suited to field battles. Mangonel is derived from the Greek mágganon, meaning "engine of war", but mangonel may also be indirectly referring to the mangon, a French hard stone found in the south of France. It may have been a name for counterweight artillery (trebuchets), possibly either a men-assisted fixed-counterweight type, or one with a particular type of frame. The Arabic term manajaniq comes from the same word, and applies to various kinds of trebuchet. It is also possible that it referred to more than one kind of engine, in different times or places, or was a general term. I Met it on the Path . . .
Star Wars and the Good Guys . . .